Viktor Postol upset Lucas Matthysse to win the vacant WBC super lightweight championship on Saturday night at StubHub Center, delivering a 10th-round knockout that took Matthysse out of the running for a potential fight with Manny Pacquiao. Postol (28-0, 12 KOs), a rangy Ukrainian guided by Hall of Fame trainer Freddie Roach, closed the show when Matthysse walked straight into a right hand and crashed to the floor. It didn’t seem like a match-ending blow, but the man from Argentina refused to rise from the canvas. “I felt a pop in my eye,” he explained afterwards, and told the referee he couldn’t continue. The oddsmakers had made Matthysse a favorite for the WBC’s version of the 140lb title, which had been vacated by Danny Garcia, who is now plying his trade in the welterweight division. Matthysse (37-4, 34 KOs) has made his reputation as a knockout artist who takes risks inside the pocket, but he couldn’t find his distance because of the Ukrainian’s long and solid jab. (Postol is 5ft 11in and Matthysse is 5ft 7in). In the early rounds, Matthysse delivered the harder punches. Postol stood in a traditional John L Sullivan stance and was content to throw a blow here and there and use his spindly arms to hold the smaller man and tire him out. By the fourth Postol was dictating the action with his jab and effective body punches. A frustrated Matthysse was swinging and mostly missing, unable to find the correct distance to create his knock out power. In the sixth Matthysse hit his foe with a strong straight right, but the power punches were far and few between. 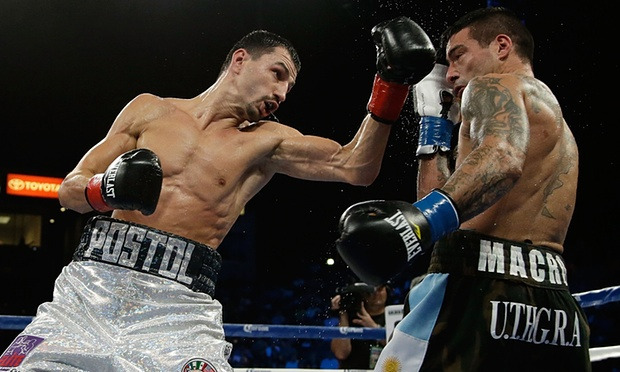 By round seven, Matthysse finally found his distance and hit Postol with several straight rights and hooks. The crowd chanted “Lucas! Lucas!”, but it was short-lived as Roach saw an opportunity for his fighter. Matthysse grew tired as the bigger man’s flurries of jabs began to yield dividends. In the corner Roach told Postol: “He is dead tired. He is ready to go out. Let him come forward. Right uppercut, left hook.” It was a combination they had worked on over and over at the Wild Card Gym. Postol went into the 10th round with his trainer’s advice fresh in his mind. Matthysse walked into Postol’s well-practiced combination and was down. “I started boxing when I was 12 years old in a gym outside of Kiev,” an elated Postol said afterwards. “My ultimate goal was to win a world championship even when I was a little boy. I made a decision to come to America, which is the mecca of boxing. In the broader boxing melodrama, the fight was an audition for Matthysse in the Manny Pacquiao Sweepstakes. Thus the surprise loss had big financial repercussions for the fighter – and will surely undercut his ever becoming a pay-per-view attraction. Postol’s size made it a difficult fight stylistically for a smaller man like Matthysse, and Pacquiao will look elsewhere. Where it leaves Matthysse is far less certain.